Little did I know upon touching down in Jakarta's airport that in under thirty hours I would have developed a sense of available zoo activities in and around Jakarta. Once settled (in yet another Mandarin Oriental) and unpacked, my research uncovered a cheap three-hour driver who would take me to the Jakarta zoo. All the animals-- white tigers, lions, giraffes, snakes, alligators and crocodiles, hippopotamus, orangutans and the grand Komodo Dragon were sleeping. Word of advise: don't go to the museum in the afternoon because most animals are nocturnal and don't do much in the afternoon. The sleeping highlights were provided by my guide, whom I did not request but had hustled himself into my visit followed by asking for an exorbitant number of ruppiahs. After settling on a far lower number of rupiahs than was requested at the end of the "tour", I found myself locked in the zoo. I guess it was an unofficial tour. I scaled the fence to my awaiting driver and prepared myself for the next day's adventure. Originally, we were supposed to go for lunch and to a market, as I've found myself quite fond of them in the AP. Once I got into the car and we started driving however, my client told me that since I went to the zoo on Saturday, she had a change in plans. We were going to a park Safari in Punga, a resort town in the mountains that's popular amongst the Indonesians. And it was two hours away. The day turned out to be quite the trip. Traffic is crazy in Jakarta. Up the mountain it's two way, but at three O'clock the two-way traffic turns to one way until seven O'clock. Imagine LIE one-way coming back from the 'Hampton's? 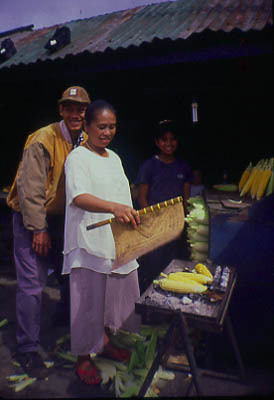 Lots of stands along the roadside- bananas, jicamas and other fruits hanging from stand to stand. The Park Safari. Let me just say that all the animals were awake, moving around and I saw four Komodo Dragons. One walking, one lying with his/her eyes open and two sleeping. I watched the sea lions perform for a group and at the end give out kisses to all those who dared. I did not participate. We drove through an area where the animals live outdoors and as we drove some of the more forward animals came up to the window for food. The orangutans did not need to. Their arms and system were such that without seeing bodies an arm was raised with the palms ready for reception. Next stop, Chaing Mai... and it's the Thai New Year.